According to the family of a Conn worker who sold this horn after his passing, this was a Conn tenor pro­to­type. Those of you famil­iar with sax­o­phones will rec­og­nize it as visu­ally sim­i­lar to the Conn “tran­si­tional” sax­o­phones that made up the period between the New Won­der series II and the M-series sax­o­phones. This one is unusual in that it is about 40,000 ser­ial num­bers ear­lier , and has an “X” after the ser­ial number. 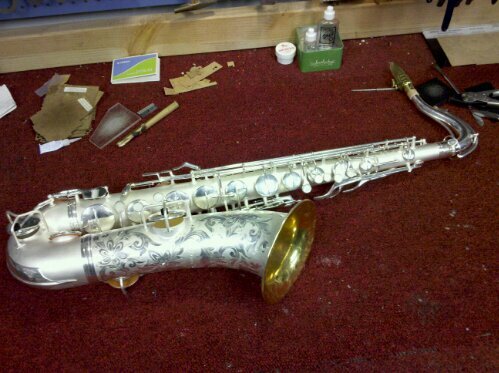 Assuming the story is true, this horn was prob­a­bly never sup­posed to leave the fac­tory, and based on its con­di­tion when I started with it seemed to have been used for prac­tice at the Conn repair school– a com­mon fate with prototypes. This was was res­cued and restored. Took me about two years of my free time.